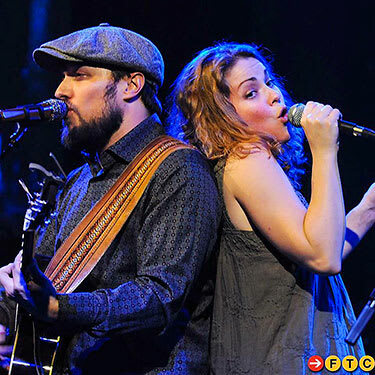 THE “ONE LOVE WORLD PEACE FUSION FESTIVAL & EXPO” LAUNCHES its INAUGURAL THREE-DAY INTERNATIONAL MUSIC, ARTS & LIFESTYLE FESTIVAL in CENTRAL NEW YORK. MAY 23, 2018. MOHAWK, NEW YORK – The ONE LOVE WORLD PEACE FUSION FESTIVAL & EXPO, presented by Nakisaki Organic Farms and The Green Kingdom presents launches its inaugural three-day, six-stage, fifty artist music, art and lifestyle festival from June 22-24th, taking place at the historical, lush grounds of the Gelston Castle Estate; located at the recently named, Green Kingdom Sports & Entertainment Complex. The grounds is centrally located in Central New York’s Village of Mohawk, just 81 miles West of Albany and 66 miles East of Syracuse. The festival will feature everything from renowned Roots-Reggae, Rock N’ Roll, Country, Bluegrass, Hillbilly, Funk, R&B, Hip-Hop, Jazz, Soca, Calypso, Chutney and Bollywood acts, as well as Rastafarian Nyabinghi Drummers. The event begins daily at noon and will benefit the Jamaica Cultural Alliance. 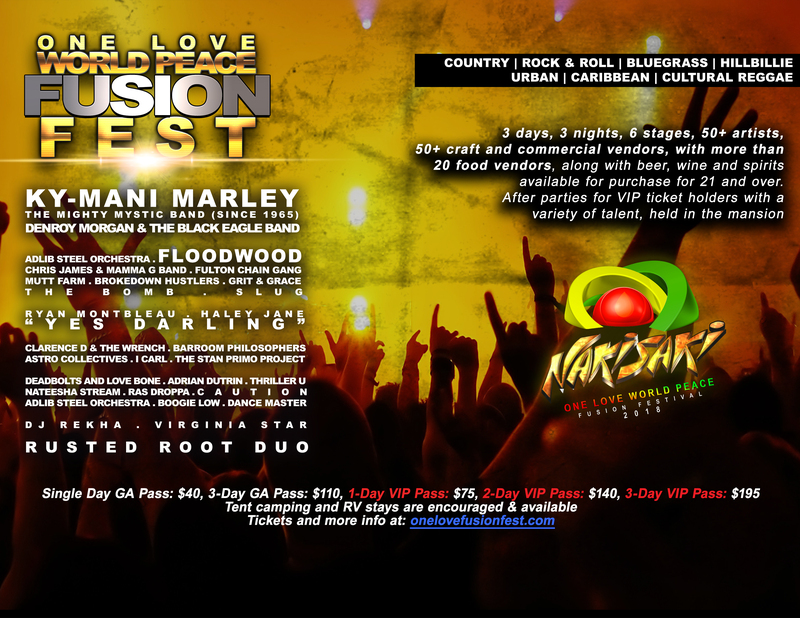 For camping, tickets, and more information are available at: onelovefusionfest.com. 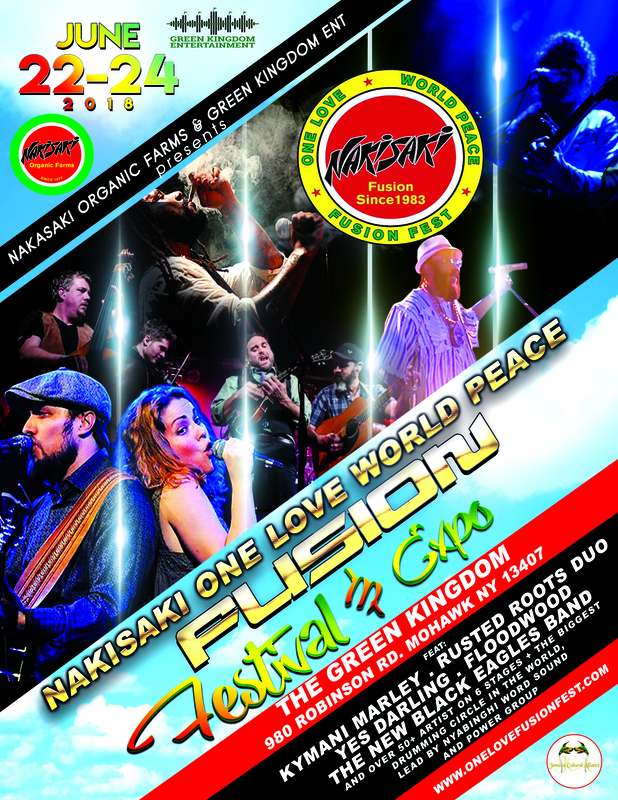 The ONE LOVE WORLD PEACE FUSION FESTIVAL & EXPO is presented by third generation’s Nakisaki and Safford Group, Nakisaki Organic Farms and the Jamaica Cultural Alliance, Inc., and is a grand-opening to the property, showcasing the historical 330 acre grounds of Green Kingdom Sports & Entertainment Complex, which was previously owned by lineage of President Roosevelt and Monroe. The nostalgic grounds is 2000 feet above sea level and overlooks the breathtaking Mohawk Valley and Adirondack Mountains. The venue will house multiple large-scale annual mixed genre festivals and themed events. Festival highlights will include an “International Food Expo” in celebration for the Caribbean heritage month, with an authentic live carnaval parade, with colorful costumes, and a Miss Caribbean swimsuit show, equipped with live steel pan bands. This section will wind through the properties private tree-lined roads. The three-day event will host the world’s largest known drumming circle, led by Nyabinghi Word Sound and Power Drummers, which will stream, along with mainstage performances at no charge on JamRoc.TV. The drumming circle is inspired for a “Drum for World Peace” movement. The event will host a ONE LOVE WORLD PEACE BOB MARLEY TRIBUTE, led and performed by the son of legendary Bob Marley, Ky-Mani Marley. After parties will be held in the property’s VIP Mansion. An exceptional light show will be featured in the sites amphitheater. A live radio broadcast will feature the festival’s music on Irie Jam Radio WVIP and 93.5FM NYC. “We wanted to introduce the property to the masses, showcasing our series of festivals to come, and create an international cultural communion where persons of all races, religions and creeds can gather to celebrate with diverse live music vibrations, great food, the arts and togetherness.” says festival co-producer, S.M. Lyn of Nakisaki Organic Farms. 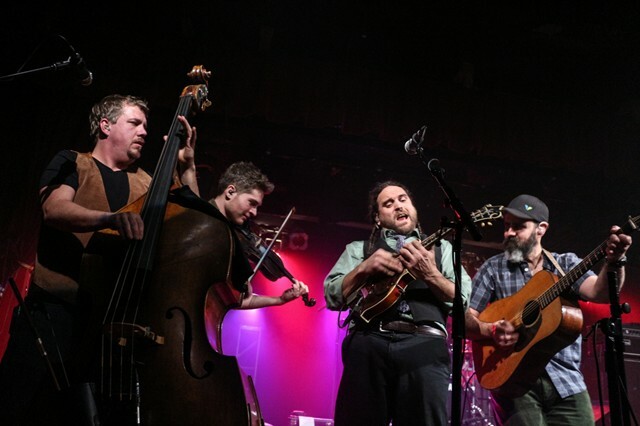 Ky-Mani Marley, Floodwood, Yes Darling (Ryan Montbleau & Haley Jane), Rusted Roots Duo, Slug, The Bomb, Fulton Chain Gang, The Mighty Mystics Band (since 1965), Denroy Morgan & The Black Eagles Band, Adlib Steel Orchestra, Chris James & Mamma G Band, Brokedown Hustlers, Grit and Grace, Clarence D & The Wrench, BarRoom Philosophers, Astro Collectives, The Stan Primo Project, Caution, Mutt Farm, Deadbolts and Love Bone, Adrian Dutrin,Thriller U, Nateesha Stream, Ras Droppa, I Carl, Virginia Star, Boogie Low, Dance Master, and DJ Rekha. A surprise international mainstage artist is yet to be announced. Price range from Single Day GA passes at $40, 3-Day GA passes at $110, 1-Day VIP passes at $75, 2-Day VIP passes at $140, or 3-Day VIP passes at $195. RV and tent camping will be announced soon. The festival begins at daily at noon and ends nightly at 10pm. To find out more about the twenty-one and over ONE LOVE WORLD PEACE FUSION FESTIVAL & EXPO, located at The Green Kingdom, 980 Robinson Road, Mohawk – New York, or to purchase tickets, visit: onelovefusionfest.com. WHEN: Friday, June 22, Saturday, June 23 & Sunday, June 24 from noon to 1opm daily. LINEUP RELEASE: Ky-Mani Marley, Floodwood, Yes Darling (Ryan Montbleau & Haley Jane), Rugged Roots, Slug, The Bomb, Fulton Chain Gang, The Mighty Mystics Band (since 1965), Denroy Morgan & The Black Eagles Band, Adlib Steel Orchestra, Chris James & Mamma G Band, Brokedown Hustlers, Grit and Grace, Clarence D & The Wrench, BarRoom Philosophers, Astro Collectives, The Stan Primo Project, Caution, Mutt Farm, Deadbolts and Love Bone, Adrian Dutrin,Thriller U, Nateesha Stream, Ras Droppa, I Carl, Virginia Star, Boogie Low, Dance Master, and DJ Rekha. FESTIVAL DETAILS: A 21 and over age, three days and nights, six stages, more than 50+ artists, 30+ craft and commercial vendors, with 20+ food vendors, along with beer, wine and spirits available for purchase for 21 and over. The festival is presented by Nakisaki Organic Farms and The Green Kingdom, along with third generation Safford and the Nakisaki Group. TICKETS: Tickets are available at: onelovefusionfest.com with prices ranging from Single Day GA tickets at $40, 3-Day GA Passes at $110. Limited VIP Passes are Available: 1-Day VIP Passes at $75, 2-Day VIP Passes at $140, or 3-Day VIP Passes at $195. RV & tent camping will be announced at a later date.